Three days after he woke up. In the Magic Academy's general purpose support magic classroom, Takeru was forced to stand next to the teacher. In front of him were Magic Academy's students taking lessons... in other words, the seats were occupied by novice sorcerers and witches sitting in rows. Rather than puzzled, it would be correct to say that everyone stared at Takeru blankly. "Nn, now the introductions〜. This is Kusanagi Takeru-kun〜. Yes, applause〜." Incited by the beaming teacher who started clapping, a few students also applauded. However including Takeru, there were many who didn't understand the situation. "Please think of him as a new comrade〜. Kusanagi-kun, you too please give us a brief greeting〜." "...I'm Kusanagi. Nice to meet you." The female teacher put a hand on Takeru's shoulder, who was trembling because of tension. "They might look at you strangely for a while, but you don't have to worry〜. Having people who do not have magic power isn't all that rare recently, and I absolutely won't allow any discrimination because of that in our class〜." When the self-introductions ended with his vague answer, Takeru was told to sit down on the furthest seat and walked to it passing by the students. There were those who looked at him with curiosity, and those who scorned at him, there were roughly just those two reactions. For Takeru, having this many sorcerers and witches gathered in one place seemed abnormal, but common sense from the outside world didn't apply here. Looking from the point of view of the inner world, Takeru was the heretical one. As for why was Takeru doing self-introductions towards the students of Magic Academy, that story dates back to the conversation they had when he met Mother Goose. Orochi said 'make Mistilteinn fall for you', something that Takeru couldn't find a meaning in, but simply put, it seemed like he had to deepen his bond with Lapis. When he digged in further, it seemed like Takeru and Lapis were counted as part of Valhalla, had various restrictions imposed on them, and would be disposed of if they tried to escape. With these words of Mother, Takeru's heart shook. She said so, and enrolled Takeru in the Magic Academy. I want you to learn what kind of beings are witches. I want you to learn what kind of thing is magic. He wanted to say that was low, but it seemed like originally Mother had sent Orochi in order to prevent Inquisition from turning Kiseki into a weapon. In other words, the one who got in their way were Inquisition and the 35th Platoon. If Inquisition didn't get in the way in the first place, it's possible that Kiseki might have been already saved. Were he to believe in Mother's words and actions, it would be premature to brand them as "the enemies" of his little sister and comrades. Takeru sat down in his seat, and looked to the side. Quietly sitting on the seat beside him, by the desk stuck closely to his without any interval, was Lapis. Although she was clearly standing out, other students weren't bothered by it whatsoever. When he looked around, sitting beside students he could see a girl and a boy who were dressed similarly to Lapis, and even an old man. They seemed to be Magical Heritages just like Lapis. It seemed like Magical Heritages with human forms snuggling up to their contractors was a normal sight in here. While watching Lapis' profile, Takeru lost himself in thoughts. Strengthen his bond with Lapis... making her fall in love for him, just what kind of condition is that. He had no idea what kind of a result would be satisfactory, but he had to act otherwise he won't be able to save Kiseki. ...still, what do I do. Ever since he reunited with Lapis two days ago, she didn't look at Takeru. She was acting as if he didn't exist. He somehow understood it when they reunited. That he had been rejected by Lapis. Honestly, he had no idea at all. He looked over his memories. During the battle with Kyouya, Lapis was still acting as usual. Like that, he assumed it's because of the event that happened afterwards. I was desperate back then... but did I do something horrible to her...? Although he tried hard to explore his ambiguous memories, he couldn't find the answer. All he knew, were things told to him by third parties. The person in question didn't tell him anything by herself. Until now, he thought of them just as of a sword and its user. He thought that's the correct, ideal way. But, surely, continuing like that was not good. They must understand each other, he thought vaguely. Takeru wanted to know more about Lapis. Not only as his sword, but as his partner... he thought he needed to build a relationship with her as his comrade. If that happens, the power of the two will without doubt grow and multiply. That's what he learned through experiences with his comrades from the 35th platoon. Takeru tried to call out to her with as gentle as possible voice, and reached out to Lapis' shoulder. Dragging her chair with her, Lapis took distance from Takeru. An unexpectedly large shock hit Takeru. He didn't think that being hated by his own sword would be this painful. The students who saw that scene started whispering amongst each other. "...hey, did you see that? That boy, his own Magical Heritage distanced itself from him..." "Are they freshly contracted? Also, he was rejected outright wasn't he." "That happens sometimes〜... there are people who sexually harass their Magical Heritages. Especially the ones who don't have much knowledge of magic and training." "He has a Japanese name, so isn't he from outside's old Japan? It's quite unusual here in the inner world." "Hmph, it's comical to see someone without magic power in possession of a Magical Heritage." "Don't say things like that. It doesn't seem like she's a magical catalyst type, if she's a sword-type, then his skill with sword rather than magic is more important. 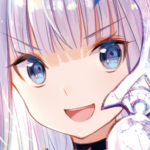 My idol Kanaria-chan doesn't hold any magic and yet she's amazing." "But he's quite interesting. Even though he's so tall, the Magical Heritage he brought doesn't match him. It must be quite sharp." Everyone started to analyse Takeru in their own way. The uncomfortable feeling was quite substantial. While Mari was the only witch in AntiMagic Academy, Takeru was the only ordinary human in Magic Academy, their circumstances were quite similar. Mari who has been sitting by the window seat, hit her hand with her fist. Silence, all whispers in the classroom have subsided. "...we're in middle of the class." As Mari glared at their classmates, everyone looked away from Takeru and faced their desks. "That's right〜everyone. Right now〜, I'm going to teach you protective magic you can use to shield yourself〜. You'll be at a disadvantage if you don't remember it, so do it properly." The teacher has gotten on board of that, and the lesson started. Honestly, Takeru didn't understand the contents in the least. Around noon, Magic Academy went into lunch break. At the same time as Takeru fell on the desk limply, Mari came over with a wry smile. "You seem totally exhausted... well, I can sympathize." Mari patted his head, hopped on Takeru's desk and sat on it. "...it's been a while since you have enrolled here, hasn't it." "Yeah. I got used to it, but honestly, I'm still confused. Studying magic, was always something to do in hiding for me." "Right. Somehow, I feel like I can understand your standing better after coming here. It's quite difficult, this kind of thing." Patting her cheek with her finger, Mari showed a troubled reaction. "Isn't it more comfortable to you? More than AntiMagic Academy that is." When Takeru said so, Mari put on a shocked expression for some reason. It was as if her expression was saying 'don't say such things'. Mari downcast her eyes awkwardly, and grasped the hem of her skirt. "I guess. Being a witch is normal in here. But somehow... being here feels unrealistic, or rather, the sense of crisis is fading away... I'm not sure how to put it, but it feels like it's not the place I belong to." "Where I belong is... um... that place." But it might be just my selfish thinking... she said in low a voice, and started to squirm. Takeru reflected on his words. He didn't mean to offend her. Currently, Takeru and Mari weren't on either the magic or anti-magic side, it was a situation where they couldn't decide on it. However, this place was safest and offered Mari decent treatment. Isn't it the happiest option for Mari to stay in here. Even if war broke out, wouldn't she be safe in the shelter. He said that earlier thinking so, but apparently Mari's feelings were the same as Takeru's. "If I stayed here alone, I feel like I would be swallowed by this place. I mean, right now we don't have the leisure to bother about that right? Getting accustomed and comfortable with the situation... feels somewhat scary." "That's why... I was really glad that you woke up." Saying that, Mari let out a small sob through her nose. Takeru overlapped his hands over Mari's on top of the desk. "This isn't where we should be... I've left you alone for so long, sorry." Being thrown into a world that subverted common sense she knew, there's no way she wouldn't feel lonely. He sincerely apologized to Mari, and tried to give her peace of mind. Mari blushed and her gaze started wandering around. Takeru didn't apologize, wasn't bothered by it, and just said what he wanted to say. He didn't know what Mari thought when she tightly grasped the hand he overlapped with hers. "Ah, ummm...aa...uu...I was lonely, I guess? Just a little I wanted to do something like this〜I think." "? Sure... I don't mind." She must have been really lonely, Takeru thought. He thought that but... their fingers intertwined. They clearly held hands the same way couples do. "——Middle schoolers? It's a middle school couple." Before they realized, two female students have crouched in front of the two, and stared at their faces from the desk's edge. Mari launched from on top of the desk in surprise. "Ww-what's with you! This is just um, palm reading... I was just looking at his palm!" While Mari attempted to make excuse in a hurry, the short-haired girl from the duo made a bitter smile. "No no, Mari, rather than making excuses there's something else you should do right..."
"Classic? She's a character from a classic book." 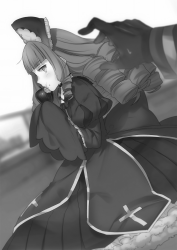 Next to her, a girl with cat ears and a tail which couldn't be distinguished whether they are real or not, looked curiously at the two and waved her tail. The two started teasing naïve Mari for flirting with Takeru. Mari refuted with a bright red face, but was handled by them splendidly. Apparently, those two have become friends with Mari over the last month. Originally Mari was a bright and cheerful girl. In AntiMagic Academy she didn't have any friends because of stereotypes and discrimination from other students. But there was no reason to discriminate against her here. Having friends is natural, Takeru thought. "So you have reunited with Kusanagi? I'm Inia Blackmore. My property is 『Steel』. Born here, in the European shelter. Magic Academy East Side's second year, one year above you, nice to meet you." The girl with short hair, Inia Blackmore held out her hand with a friendly smile. When Takeru shook hands with Inia, the girl with cat ears beside swung her tail back and forth. "And I be Ananda Nodens. My property is 『Thunder』. Grew up in the smallest shelter in South Africa. I be in same year and class ya are. As you can see I'm quarter demihuman, but I'm not going to add any 'nya's' at the end of sentences, remember that." 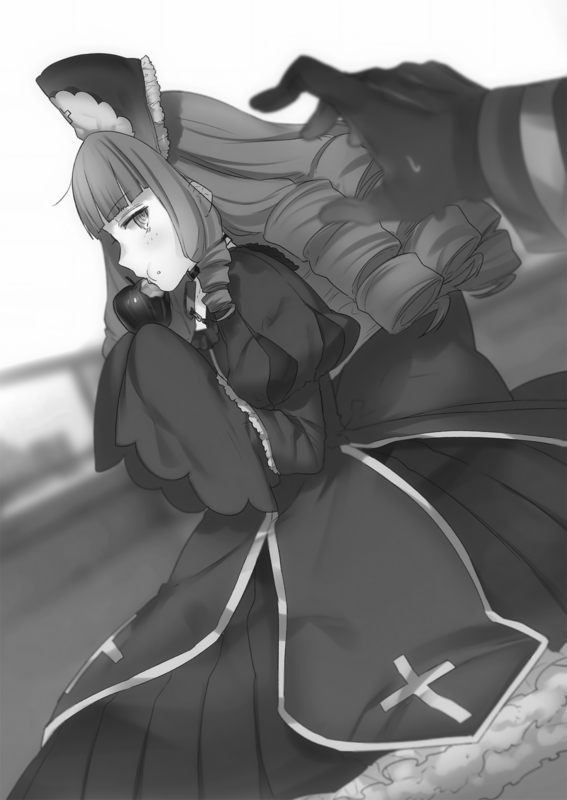 Sniffing loudly she looked like a catgirl, she bent her tail into a く shape and approached Takeru. Confused, Takeru tried to shake hands with her, but Ananda went "nya! ", and moved away with a scream. Her hair stood up, and for some reason she looked vigilant. Inia looked at Takeru's startled expression. When he was upset, Mari whispered into his ear. "I did the same thing before, but for the cat races shaking their front paws is a display of courtship... they greet each other by entwining fingers or tails." "You serious. Eh, so demihumans really exist..."
Takeru was surprised to learn that Ananda's ears and tail aren't a decoration. The Ajin. Called half-beasts, it's a race of half-humans and half-fantastical organisms. There were records of small cat tribes existing in some areas before, but they were supposed to have gone extinct during the Witch Hunt War. There was no way Takeru would know what the common sense of demihumans was like. Once again, he realized that in this place, extinct races existing is normal. Ananda blushed and shyly scratched her face with her front paw. "...can it be that Kusanagi came from outside too? You seem close with Mari." When Inia asked that, he wondered what would be the best answer. Takeru didn't know how was the outside world thought of in here. "Takeru came to the inner side together with me. Our parents are good friends... and when we got involved with Inquisition they sent us here since it's gotten dangerous." Inia and Ananda seemed convinced after Mari told them an improvised explanation she thought of. "I see, then it's no wonder you don't know the common sense of this place. We don't know much about the outside, but witches are regarded as evil in there right? I imagine it's an outrageous place." "Although I got suddenly scared, if it's like that then I forgive you. Well done coming here, human. If there's anything you don't know, feel free to ask." "Fufun", Ananda spoke like a senior to her junior. Takeru glanced at Mari beside him who shrugged, and decided to take her up on her words. "That's a great help. Then, it might be abrupt but what do you mean by 'East Side'?" Since it often appeared in what he heard he thought it's suspicious, so he asked after hearing Inia say that. "Seriously, you enrolled without knowing that... amazing." As he apologized, Inia went "oh well" and laughed it off. It seems like she has a personality that doesn't mind the little things. "East Side, are the eastern part of the shelter where school facilities are. On the other hand, the West Side has its own facilities. Both Magic Academies have their own Chairman, making up two factions, or rather, they have different education policies. East's policy is 『Harmony』 focusing on defence and healing, as well as industrial magic. Environmental protection and sanctuary's research is popular in here." "On the other hand, the west side's policy is 『Pure Blood』. Well, you can think of it as of military school. They are teaching strategy and magic useful mainly for military." "Make sure not to get close to the West Side. The pureblood's principle is that mixed races like Ananda are absolutely unacceptable, and that's nowhere close to the discrimination people without magic power suffer. I don't know what they might do, but make sure to be careful." "Yeah. You should think of east and west side as different worlds. Unfortunately the western side is overwhelmingly broad and highly populated. We don't fight too often, but since this side has no chance of winning we recommend not to pick a fight with them." "The Witch Hunt War is deeply rooted in them I guess... they're destined to fight with people who don't have any magic power. Honestly, since we are the generation that was born after the war, we can't get a good grasp on it. Although, there are those who were raised in environments related to war." "There's a difference in education. Although the education policy has been getting closer to East Side's recently, majority is still closer to West Side. As soon as the rumour about war appeared, they have started running rampant." "Yeah. That's the current state of affairs. Especially the recent days, it's not advised to approach it." Takeru nodded after hearing Inia's advice. Ananda shook her head saying "good grief" at the current situation. "Personally I'm not interested in all that. But it's annoying to live here when shelter is in that state, as if we weren't already fed up with problems from outside." "I would prefer being at peace with people from the outside. There's no fun in being dragged into the war from 150 years ago. After all, we can speak with Kusanagi normally like this thanks to that." As they alternated explaining, Takeru has slowly began to understand the inner world's reality. In short, it was something like AntiMagic Academy and the Ethics Committee... the conservatives and dissidents. Just in this shelter were about fifty million people, and a lot more witches and sorcerers seemed to live in other shelters. And most of them, were thinking similarly to how the West Side does. Mother Goose managed the East Side, and the West Side was managed by purebloods. Were he to believe in Mother's words, it was obvious that the senate which governed over this inner world came from West Side's population and was closer to them. Nevertheless, it paled to the overwhelming discrimination as compared to AntiMagic Academy. Even if east and west were polar opposites, people from the East Side were willing to accept Takeru who was a human from the outside and didn't have any magic power. And in the AntiMagic Academy the only ones to accept Mari was a handful of humans from Small Fry Platoon. The amount of information the outside has about the inner world is nearly equal to none. Although there are rumours of witch forces surviving inside of the Sanctuary, most of the general public doesn't believe that. It was probably because of thorough information control and brainwashing education. Although people from the inner world were aware of the outside's existence, their recognition when it comes to actual situation was quite shallow. If Inia and Ananda knew about the violence with which Inquisition treats witches, they wouldn't have been so carefree. "...as I thought, people without any magic power are unusual here aren't they?" 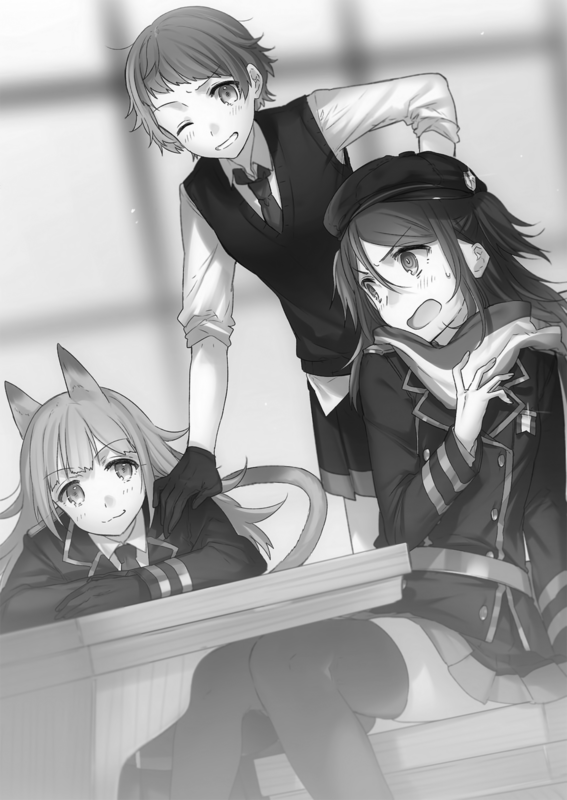 "Nyaa, there isn't that many, but at least few of them are here on the East Side. Look, there." He looked in the direction Ananda pointed to. With her back against the students' lockers, stood a girl with blue hair glaring in their direction. Takeru was startled by the very familiar-looking blue hair. When he thought about it, he recalled that he was a prisoner. It was obvious that he'd be monitored. Also, her gaze had a deep resentment embedded in it. Apparently it's because of the fight last month, and him acting like a senior pupil. Since she wore Magic Academy's uniform instead of the body suit, she must have been a student in here as well. Inia turned towards Kanaria and prompted her. "Heey, Kanaria. Don't scowl over there and come over here." Even though she was called, Kanaria only snorted and remained standing there with her arms folded. "She's Kanaria. You see her long ears? She's a half-wood elf. "Indeed. In exchange for lack of magic power, wood elves' bodily abilities surpassed that of humans. She's living on the East Side mainly for protection." "I am a demihuman just like her but... she's from an endangered species. Apparently she's been born of the last wood elf that has survived the war. I don't know the details though." When he heard that story from Ananda, a memory rushed to Takeru's head. An incident involving elves was still fresh in his memory. In the inner world, elves being extinct was a fact as well. Although he compared it to what he heard before, first, her age didn't match. Also, he heard that she was disposed of, so it would be funny if she was in Valhalla... the Magic Academy. Takeru didn't have much information about Ikaruga's failed elf. Ikaruga hated prying into her matters, and he also avoided digging into it as much as possible. However, it was a fact that it bothered him. Takeru stood up and was about to go to ask Kanaria about it, but then Inia called out to him again. "By the way Kusanagi... where did your Magical Heritage go?" She posed an unexpected question. "You had an azure girl with you right? I wanted to ask about her too but... she disappeared the moment lessons finished. Is it fine to leave your Magical Heritage alone?" "Oh, I was curious about the same thing. Where did you obtain a Magical Heritage? Is it something passed down from generation to generation in your family? I felt a tremendous and alien magic power from it. She caught my eyes since I study Magical Heritages... anya?" After saying that much, Ananda and Inia looked at Takeru's pale face. He looked towards Mari. Mari shook her head energetically saying "I don't know?! ", then next he looked at Kanaria in the back. Kanaria's face paled just like Takeru's. "——Idiot idiot idiot!! Even though you're her contractor! Why did you let her get out of your sight?!" Kanaria, Takeru and Mari were sprinting together through Magic Academy looking for Lapis' whereabouts. "I'm ashamed...! I've gotten used to the situations where she's there yet she's not, and didn't notice it when she suddenly disappeared!" "No excuses! Have some shame!" Takeru who has been showered with jeers from Kanaria, who was running beside him on his right, turned smaller and smaller. Mari who was running on his left flared up on Kanaria instead. "You're not the one to say that Kana-chan! You're supposed to monitor them and yet you let her out of your sight!" "S-shut up! Mari has been asked to act as the monitor by Mother as well! You're same! Guilty!" "I have no obligation to follow your orders! Why do I have to watch over Takeru who's my comrade!" "Not Takeru! Michir...mistera... mi... ah come onnn." Kanaria continued to bite her entangled tongue, and ran while scratching her head strongly. The three continued to search avoiding the students, not bothered by the fact that they were conspicious to other students. Mari started running late, and because of either time difference or luck, a man clad in kimono walking down the hallway had come into their sight. "Ohh, whash, whacha guys dyoin?" It was Orochi. He walked towards them with anpan in his right hand and milk in his left. Takeru who was in front stopped, and placed hands on his knees in front of Orochi. "Master, why are you here?" "Why you ask, I'm one of the teachers in here." "I'm in charge of physical education. Haa, Mom won't shut up and continues to repeat that I should work if I live in here." Teaching physical education using Double-Edged style's basics. That's definitely not basic level is it. "Rather than that, why are you in such a hurry." "Actually... I lost sight of Lapis." Takeru admitted his blunder and prepared himself to get beaten up. However, Orochi just continued to eat the anpan with a blank look. "Issat sho. Well, do your besht." "A Magical Heritage won't do any harm unless the contractor uses it. And you're wearing the collar too, there's no need to panic that much." "Won't you look for it together with us?!" "? That's your sword isn't it, why do I have to do something like that. Also, I have a class now, I don't waaant to. ............what 'I don't waaant to' dammit. Even as blood vessels appeared on his temple, Takeru smiled and swallowed the voice of his heart. "Orochi!! That's why Kana was against it! It's impossible for a guy like this to master Misuchalachein!!" Kanaria went past them at high speed. In addition, Mari slowly followed her. "Hohoo, nice to see you energetic again. Youth is truly wonderful." Hearing Orochi speak nonchalantly, Takeru couldn't even smile wryly. He has already forgotten, but the man called Kusanagi Orochi was basically a no-good adult. He gave up on obtaining Orochi's cooperation, and started running again. But, Orochi immediately grasped Takeru's collar and restrained his neck. "W-what are you doing really...!" "I'll give you an advice. Did you have to look for your beloved sword before, even a single time?" "She always responded your call, and appeared right beside you spontaneously on her own. In other words, she always knows your whereabouts. In that case, it wouldn't be surprising if it worked the other way around as well." Orochi turned his face towards Takeru while drinking his milk. Rather than in thought, he just seemed amazed. "Looks like for the time being the sword's affection to you is stronger. Seems like the erosion is one-sided." "I'm not saying that you have to trust them, but what kind of swordsman you are without a sword." He said so, poked Takeru's forehead with his fist, let go of his neck and started walking. Orochi waved his hand and left. Takeru was unable to respond and just looked at his back. Whether she's a Magical Heritage or a Sacred Treasure, the fact that Lapis is a sword didn't change. Geez, I was unable to refute in the least. Takeru quietly lowered his head towards Orochi's back, and listening to his heart he headed to where Lapis was. Not hurrying, Takeru followed the haze in the depths of his heart, feeling that it connected him to Lapis, and went up the stairs. Surely, their connection has become stronger thanks to the re-contract. After he went to the top of the stairs, he pushed a heavy iron door open. Light wind stroked his cheek, and naturally Takeru's gaze was attracted to the sky. He squinted faintly at the gentle light blocked by the ultraviolet protection barrier. The sky wasn't too broad, but it had a colour that couldn't be seen on the outside. Light was diffused into pale colours of the rainbow. And inside of the barrier's membrane were flying flocks of crows with three tails. The buildings and various grounds were flying randomly arranged, but they never collided. While the buildings were full of various machinery, on top of their roofs lush plants could be seen. Since magic power was harmless for nature, the greenery was lively. Although he was shocked seeing that sight in the night when he woke up, it was a fantastic and beautiful sight when seen in daytime. Because it's been referred to as the country of witches, he thought it would be full of ominous things, but that wasn't the case at all. He felt as if he was inside of a picture book. Takeru took a deep breath, and turned his gaze in front of him. He saw an azure-coloured person sitting on the edge of the roof that had no fence. Lapis' hair was fluttering in the wind, making her back seem smaller than usual, she looked lonely sitting there alone. Next to her, he could see a large amount of apples packed in a paper bag. On the quiet rooftop, the only sound was coming from Lapis munching on the apples. She matched the beautiful landscape, but her back looked incredibly lonely. Takeru approached her in silence, and immediately sat down next to her. "Yo. Eating lunch alone? If you're going somewhere tell me beforehand." "Woah, this is insanely high. Since I can't fly unlike other students, it's quite scary." "............y-you're eating apples huh. That's a lot of them. Give me on——"
When Takeru reached out towards the apples, Lapis picked up the paper bag and took distance from him. With his arm still stretched out, Takeru seemed as if he's going to cry from shock. Lapis stared far into the distance and continued to munch on the apples. Takeru curled up and spat out a grand sigh. "...hey, isn't it about time you told me the reason?" "I am fully aware that I'm insensitive but... did I do something to you? I don't remember what happened back then too well." "There's a lot I want to ask you, but if I did something then I would like to properly apologize. At least let me hear your voice." "(*munch* *munch*... *crunch* *crunch* *crunch* *crunch* *gulp*)"
"...........................don't eat the cores as well." Lapis didn't pay attention to him and took out another apple. Takeru scratched his cheek and smiled wryly seeing Lapis distance herself. "When stomach is filled, depression subsides... huh." When he said that while looking up at the sky, Lapis stopped eating the apple for a moment. "Certainly, that's what your previous host said right? It's a wise saying." Lapis didn't answer, she moved the apple away from her mouth, wrapped it with both of her hands, held it against her belly as if it was important to her and looked in the distance. "But, that means I have made you feel unpleasant after all." "...I have hurt you... right?" Not looking in Takeru's direction, Lapis slowly opened her mouth. "Hurt... there's no confirmed scratches on the blade, so you don't have to worry." It's been the first time in a while since he heard Lapis' voice, as usual there was no intonation. However, somehow there was some kind of feeling of rejection in there. The thinking circuits of a human and a Magical Heritages are different. The things that hurt humans aren't the same as ones that hurt Magical Heritages. Sometimes there's trouble in understanding their behaviour and actions. When Takeru was together with Lapis, it wasn't as if he didn't doubt her attitude. Until now he had no intention of butting in. What Takeru looked for was a relationship of a sword and its user, and Lapis was the same. But they should be able to understand each other if they try. After all, he could feel Lapis' heart better than ever before. "If you're asking if I can bear the mental burden, then you do not have to worry about that as well. I am a Magical Heritage, I do not suffer mental traumas like humans do." "There's no way that's true. I think you've got considerable pride, and you've been jealous before too." "I wonder what are you talking about." "...compared to others, aren't you quite obstinate?" "I don't think there is any need for further interference, after all you aren't my host no longer." Not her host. Hearing her say that, Takeru frowned. "Just like I said. You have let go of me. That's all." "Let go of... I don't remember anyth——"
After he said up to there, a memory has flowed inside of Takeru's head along with noise. The moment he was trying to commit double suicide together with Kiseki, he certainly let go of Lapis. He resolved himself to resist everything, however, the only way to do it was to abandon the choice of killing Kiseki. "No, back then I didn't really have intention of discarding you..."
"It is the same thing to me. I do not intend to blame you really. I was not worthy enough as an instrument fulfilling your wish. That is all." After just saying that, she started to eat another apple. In other words, Lapis interpreted it as being abandoned and had turned timid. I thought so before already, but she has her cute parts after all. Takeru thought. At the same time, he felt lonely since she wouldn't call him her host. "...but, our contract hasn't been cut. Even now, I'm still alive." "I'm a Magical Heritage, and so my fighting force is minuscule alone making me vulnerable, it can be called practically nonexistent. Currently, my current status is that of Valhalla's captive, so it's not a good idea to cancel the contract immediately." This is how being abandoned by one's partner felt. Even though he had no such intention, it was true that he let go of her back then. Takeru bowed to her obediently. "There is no need to apologize, I should have said so already." "No, I am the one at fault. I have arbitrarily forced my wishes on you, then selfishly abandoned that wish. It's true that I have no excuse to you, who got disappointed by my indecisiveness." Saying a heartfelt apology, Takeru leaned towards Lapis. "That's why at the very least, please give me another chance." "Why is that. I should be no longer necessary to you." "No, I need you that's why I say it." "For self-protection, is it. Or maybe for Kusanagi Kiseki's sake, I wonder." "That's not all. As a swordsman, and as a human being I don't want to let go of you." "Yeah, I want to think of you as of my comrade." Although what he said was his true feelings, Lapis tilted her head puzzled. "I should have said already that I'm a Magical Heritage." "I know that. And I as a human, don't want to let go of you." "As your partner I... want to know more about you." With a serious expression, Takeru conveyed his feelings to her. For the first time after coming to Magic Academy, Lapis looked at Takeru. The azure hair swayed as the wind blew. "Even if you know, what will you do. I think it's meaningless." "There is a meaning. It's something necessary for me to stay beside you." "...I don't understand it too well, but I will answer your question. Since I have already left management of Inquisition, the restriction on speaking has been removed." As usual, she was expressionless. However, to Takeru, that appearance of hers displayed sadness. In an incredibly distant location with nothing in it, standing alone in the ruined world, such an image of hers appeared in his head. Unconsciously he stretched out his hand, wanting to relay to her that he's right beside. He held down the strange impulse, and asked what he wanted to hear from her. "Is it true that you are a Sacred Treasure, a product of another world?" First, he asked the question that approached his heart first. "Yes. It is true. World's identification number 1023, in other words, I was manufactured in world of myths, a different dimension referred to as Norse Mythology in this world." Although he was told that before, it would be a lie to say that he received no shock. "...then why do you exist in this world? Even if summoning magic was used, there shouldn't be enough supply of magic in the present to do so." "The reason is unknown. My information of Norse mythology's world has been damaged. At the same time, what could be called my personality has appeared after I came to this world... to be more precise, it's something that was born at the end of the Witch Hunt War." As Takeru took a breath, Lapis responded indifferently. "With 98% probability, the world of Norse mythology no longer exists. For some reason it has been destroyed. At present, it's impossible to contact the world of Norse mythology via summoning, which adds credibility to the hypothesis." Destruction of a mythological world... it was something he never heard of before. However, Lapis didn't say any lies. Now that their connection has grown stronger, he could tell that immediately. "...that you drove this world to ruin... and caused the Akashic Hazard, true?" "Strictly speaking, that's wrong. Akashic Hazard was not caused by me alone, a collision with another Twilight Type——another Sacred Treasure has caused it." "A magical sword called Lævateinn that holds the same god-slaying power as I do. Although it lost most of its capability, it has been confirmed to be in hands of Valhalla." "...then, Inquisition and Valhalla have used you and Lævateinn, and caused that disaster?" "When the two God Hunter Forms clashed, my 『Twilight』 magic property and Lævateinn's 『Destruction』 magic property intermingled during collision, there was an outbreak of 『Void』 magic property, which has covered the world." Both Inquisition and Valhalla possessed Sacred Weapons which were their ultimate weapons. And when Valhalla used Lævateinn, Inquisition used Mistilteinn to counter it. Because two weapons of mass destruction were used against one another, the world fell to ruin. It was a horrifying story. "In the end, who won?" "We have partially destroyed Lævateinn and inflicted a serious injury to its contractor, but if one were to look at the result, then it would be a draw." "What happened to your previous host?" "She lost control of the God Hunter Form, went berserk and died." Takeru didn't miss the short pause before Lapis spoke. Since it was important to learn details of the God Hunter Form, he absolutely had to learn it. "That host, what kind of person was it?" "I'm interested what kind of person has fought together with you. To handle you, it must have been someone considerably skilled right?" "The host's skill was not as good as yours. However, it's true that it was a strong person." When Takeru asked her, Lapis looked at Takeru with her pupils that looked like marbles. "Kusanagi Mikoto. She was of the same lineage as you, in other words, a woman of Kusanagi household." For a moment, he was surprised to the point where his heart almost stopped and he lost his voice. "You said she was a woman? Just now, surely!" "Then she should have been in the same state as Kiseki!" "No, it wasn't the same at all. Although she suffered from her own power, but she wasn't constantly going out of control." Takeru approached Lapis mercilessly, and grasped her shoulder. 150 years ago meant it was four generations of Kusanagi family in the past. The power of 『Hyakki Yakou』 might not have been as great as it is now, still, it should have been impossible to restrain that power by oneself. And above all, it was a tradition for Kusanagi family to kill children born as women as they are born, unless something out of ordinary happened she shouldn't have been alive. "Please tell me about that person! There might be a clue about how to save Kiseki!" But that's when the door has been opened vigorously. Kanaria appeared from behind the doors, her shoulders raised and lowered down roughly. "Haa... haa... you... what are you doing...!" "What you ask, I was just talki...."
"You're eating apples in a place like this instead of searchinggg!!" "Wa-wait, wait a moment! I was searching and found he——eehhh...?" He looked back to confirm Lapis was there, but even though he was holding her shoulder, she was nowhere to be seen. Only the paper bag with apples was left behind. "No wai?! Wait, just now she was——"
Kanaria ran towards him and attacked him with a flying kick. He would die if he took her straight man act poorly, so he averted his body to avoid it. Because he avoided, Kanaria's jump continued and has directly fell down from the roof. She dived from the rooftop that was easily 500 metres above the ground. Takeru caught Kanaria's hand in a hurry, but the unstoppable momentum carried him and he also dived down from the roof. He entangled with Kanaria whose eyes were full tears in her eyes and they fell down to the ground together. Honestly, he didn't think that he would die in such a dull way. Even though he finally shook off his indecisiveness, to think the curtain drop of his life would come from the wood elf's flying kick. In order to have at least Kanaria survive, Takeru hugged her and inverted their bodies, trying to move under her. "?! Don't touch my breasts baldy!!" "It's not time for th——guohh!!"" Kanaria launched an elbow into his solar plexus. Why do I have to to be called a baldy and beaten up while doing acrobatics in a situation like this. "I've had enough" Takeru muttered with tears in his eyes. But that's when Kanaria grasped his collar. In middle of the fall she grabbed onto the edge of the school's window and hung on it. Although Takeru's neck let out a crack in response to sudden stop, their fall stopped and both of them were safe. Wood elves were nimble and had superhuman strength, but that was already beyond their level. Kanaria was fuming as she glared at Takeru. "I'll report this to Mother... I'll make it so you can't walk around freely, so prepare yourself...!" Then, Kanaria swung Takeru's body with abandon, throwing him into the school building. At the end of the violent rescue, the school's students directed strange looks at him as he shed miserable tears on the floor full of glass from the shattered window. Should be: "but what kind of swordsman are you without a sword." was the mistake I found. ..., but a common sense of outside world didn't apply here. -> ..., but a common sense of from the outside world didn't apply here. I want you to learn what thing is magic. -> I want you to learn what thing is magic. All he knew, was something told him by third parties. -> All he knew, was something told to him by third parties. "Hmph, it's comical to see someone without magic power in possession of Magical Heritage." -> "Hmph, it's comical to see someone without magic power in possession of a Magical Heritage." Mari who has been sitting by the window seat, hit her hand her fist. -> Mari who has been sitting by the window seat, hit her hand with her fist. Just in this shelter there were about fifty million people, and a lot more of witches and sorcerers seemed to live in other shelters. -> Just in this shelter there were about fifty million people, and a lot more of witches and sorcerers seemed to live in other shelters. The amount information outside has about the inner world is nearly equal to none. -> The amount of information the outside has about the inner world is nearly equal to none. Although he compared it to what he heard before, first, age didn't match. -> Although he compared it to what he heard before, first, the age didn't match. ..., Takeru smiled and swallowed the voice of his heart. -> ..., Takeru smiled and swallowed the voice in his heart. After he went to the top of the stairs, he pushed heavy iron door open. -> After he went to the top of the stairs, he pushed a heavy iron door open. While the buildings were full of various machinery, but on top of their roofs, lush plants could be seen. -> While the buildings were full of various machinery, but on top of their roofs, lush plants could be seen. OR While The buildings were full of various machinery, but on top of their roofs, lush plants could be seen. At Takeru took a breath, Lapis responded indifferently. -> After Takeru took a breath, Lapis responded indifferently. Yes, miserable tears. Cry moar. if you don't add nya you simply are not worthy of that cat tails and ears. "Ananda went "nya! ", and moved away with a scream." "Nyaa, there isn't that many but at least few of them are here on the East Side. Look, there." "She caught my eyes since I study Magical Heritages... anya?" See, no problems, she does say "nya"! Hurray! Lolol...why do I feel like it's really similar to date a live sword now...? Thank for awesome work. Then i leave my crest.